Creativity isn't an occupation, it's a preoccupation. It is at the very core of what makes us human. It's also a fundamental challenge that everyone faces in the modern world, be they in business, in education or a struggling artist or musician. Being creative and innovative and communicating our ideas effectively and persuading others is vital. Who could be better able to demystify and set out some useful, generous advice on how to improve, sustain and nurture creativity than one of the world's greatest advertising creatives and founder of an advertising agency renowned worldwide for its excellence? 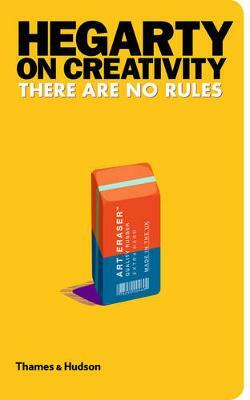 In this book, John Hegarty takes 50 provocations and themes that lie at the heart of creative thinking. These range from those with complex depths that lie beyond deceptively simple titles such as `Idea', `Ego', `Money' and `Technology', to others that look at the complexities of modern life, such as dealing with cynics in the workplace, or the best way of getting angry. Hegarty's message is always crystal clear and promotes the benefits of simplifying, thinking boldly and being undaunted by challenges. With this book, when a challenge confronts them, readers will find that one of the great minds in advertising is there to guide them. Playful text and graphics and plenty of white space make this a good choice to pick up and grab inspiration at random. Little mantras for the inspiration-starved.